Over/Under: Over 144.0 at 1.90 Bet Now! This is the series that caused all of the commotions so far in the Euroleague Playoffs. Fenerbahce are clearly a very strong team in the Euroleague, as their runner-up spot in last year’s Championship proved, but not many people predicted that they would win the opening two games in Greece. Panathinaikos’ home court advantage has been completely wiped out and the Istanbul side lie one victory away from the Final Four. With two games in a row to come, you wouldn’t bet against them achieving this. If Fenerbahce make it through to the Final Four, they will become the first Turkish side to achieve this three seasons in a row. The two away wins at the start of this series set a bit of history as this was the first time that two road wins opened up a modern best of five series in the Euroleague. This sets up the chance for the home side to book their passage through to the next stage of the tournament but of course, the two defeats in Greece means that Panathinaikos are in a do or die situation right now. Bogdan Bogdanovic has been in fantastic form in the opening two games of this series, hitting 24 points and providing 5 assists per game, but it is not as though he has been the only excellent player for the Greek side. Ekpe Udoh has an average of 15 points per game, Bobby Dixon has chipped in with an average of 13.5 points per game and Nikola Kalinic has offered an average of 11.5 points per game, all of which means Fenerbahce have players on form right now. Please toggle your mobile phone into landscape mode to see additional content. Mike James has offered an average of 18 points per game for the Greeks in this series and he has been backed by KC Rivers, with an average of 12 points per game while Chris Singleton has chipped in with an average of 8.5 points per game. This basketball odds comparison table refreshes every two minutes. 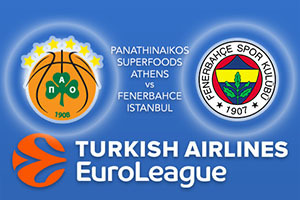 The bookies expect the Turkish team to clinch the series but why not take Panathinaikos Superfoods Athens at +6, at odds of 1.90, as the Greeks will be desperate to keep the series alive. For the Over/Under market, go OVER 144.0 at odds of 1.90. Bet Now!